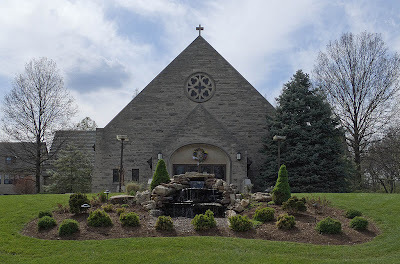 HERE ARE PHOTOS of Sainte Geneviève du Bois Church, in Warson Woods, Missouri. The church is located in suburban Saint Louis County, about 14 miles west of downtown Saint Louis. The parish dates from 1956, and this church from 1978. Because of the low camera angle in this photo, you can't see the spire on the church roof. Warson Woods is a bedroom community of Saint Louis, and its origins date from the mid-20th century. Click here for a history of Warson Woods. These photos were taken in April. "tossed by the waves, she does not sink"
The motto of the City of Paris, of which Sainte Geneviève is patroness. 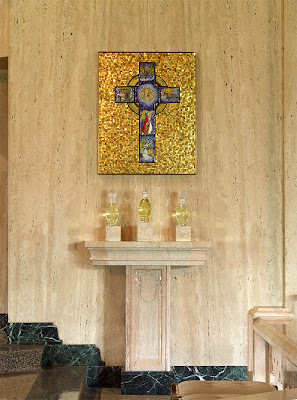 This is a modern church in its form, but the liturgical art is more traditional and beautifully executed out of fine materials. Christological mosaic on the front of the altar. 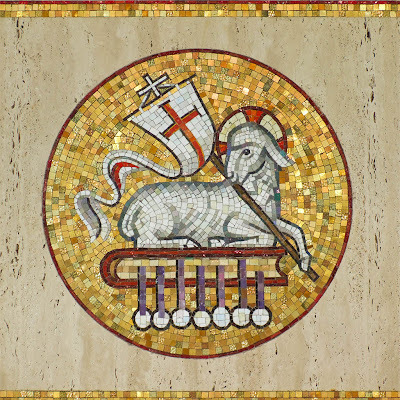 The Lamb of God, a spotless victim, carrying a victory banner, and seated on a book with seven seals. This symbol of the judgment of Christ dates back at least to the 5th century and is inspired by the Apocalypse of Saint John. 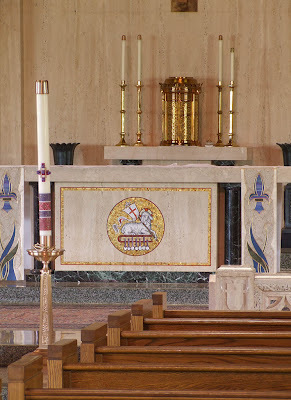 Ambo and altar, both finely made. 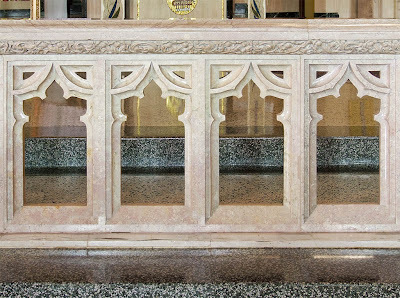 The tabernacle is on a pedestal with a mosaic of the Sacred Heart, "O Heart of Love"
The communion rail is nicely carved out of stone. 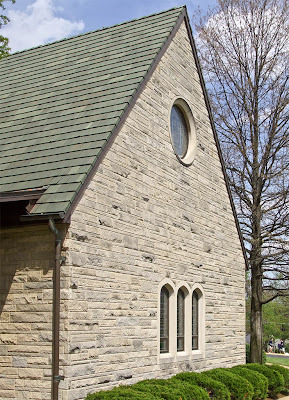 This church uses much attractive decorative stone. 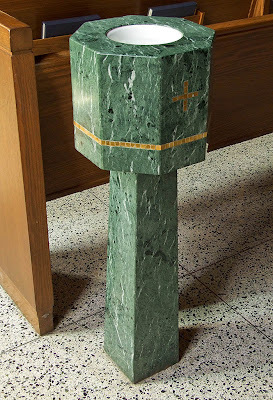 This holy water font is made of a green stone, which seems to be often used around here; if any reader can identify it, please let me know! The stations of the cross are executed in stained glass. 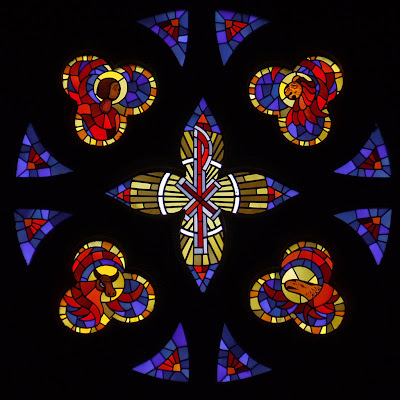 Rose window shows symbols of the four Evangelists. Exterior of the church. It is simple, but well-made. 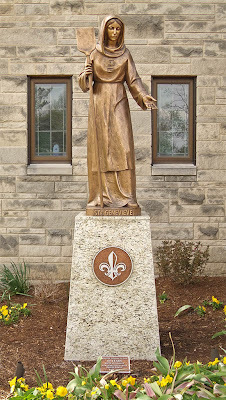 Statue of Sainte Geneviève (ca. 422 - 512), patroness of Paris. 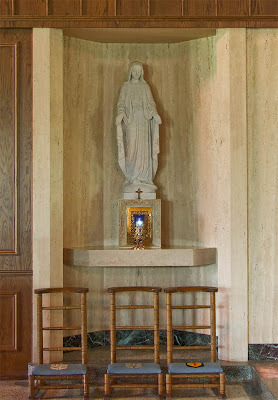 Her feast day is January 3rd. She is shown here as a peasant woman. In her life, she saved Paris from invasion on several occasions through her prayer, hard work, and inspiration to the people. The "du Bois" in the church name is French for "of the woods", as in Warson Woods, where the church is located. 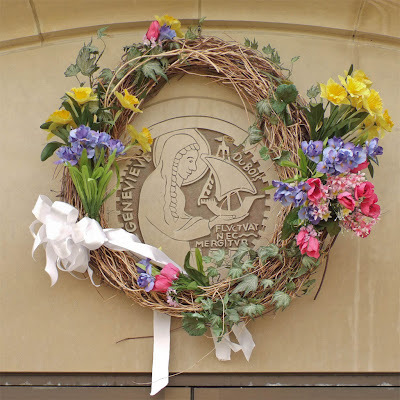 There is another Sainte Geneviève parish in the Archdiocese, located in the town of the same name; that parish dates from 1759. The school, built in the same style of the church. 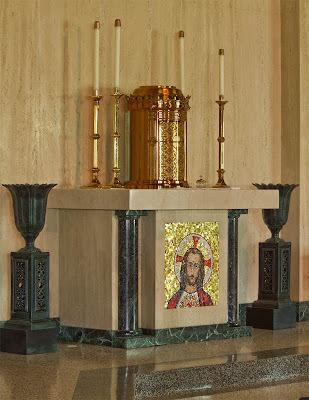 Monday-Friday: 6:30 a.m., 8:00 a.m.
Saturday: 8:00 a.m., (Vigil): 5:00 p.m.
Sunday: 7:30 a.m., 9:30 a.m., 11:00 a.m.
Holy Days: 6:30 a.m., 10:00 a.m., 5:45 p.m.
Saturday: 4:00 p.m. - 4:45 p.m.
Wednesday: 8:30 a.m. - 9:30 a.m.
First Fridays: 8:30 a.m. - Saturday at 7:30 a.m. I used to live in Pasadena. Went to college there; it's a fine town. That is quite a beautiful church. I have a daughter named Genevieve and was just searching the name for fun and ran across this site. 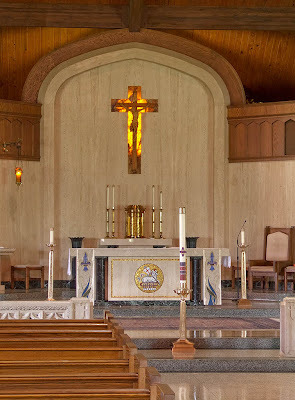 The next time we visit St. Louis we will make the trip to Warson Woods to visit the Church. Thank you. The church was formerly housed in what has since become the gymnasium for the school. Most of the stained glass windows (with the exception of the rose window and maybe one or two others) were transferred from the former church and incorporated in the new building at the time of its construction. Also, the third floor of the school building used to house the rectory (beneath the steeply peaked roof; hence the dormers), prior to the construction of the new rectory in 1980. It was actually quite spacious and comfortable, and was accessible both by stairs and by elevator. Monsignor Lodes, the pastor who built the church and rectory, retired to the old rectory after suffering a stroke, and lived out his final days there. I believe that the school has since annexed the old rectory. I recently came across a sermon the Rev. George A. Lodes gave at the requiem mass for my great-grandfather, James H. Lieber, on June 22, 1951. The writing is superb. I am curious, did the Church have canned (as we say today) eulogies or would Monsignor Lodes have authored the piece himself? The sermon is almost literary. There are no 'canned' sermons. Writing them is a high art which many priests take very seriously. 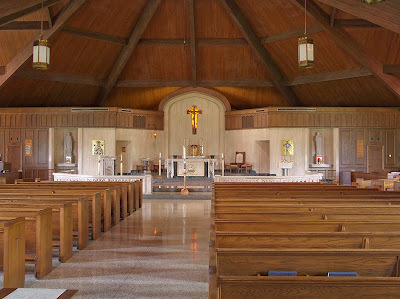 The original church, many don't know or remember this, was on Beaucaire Dr. My Great Grandfather bought the property at 525 Beaucaire Dr in 1957 and my Grandmother remembered just going up two or three houses to attend mass. This of course, was when Woodlawn was a dirt road. Msgr Lodes was there until 69 or 70 I believe. My father was a man named Lee P. Campau, Jr., who was a very successful home builder in St. Louis City and St. Louis City. While a member of St. Roch's Parrish off of Waterman Blvd. my parents became good friends with Father George Lodes, who was the assistant pastor there. 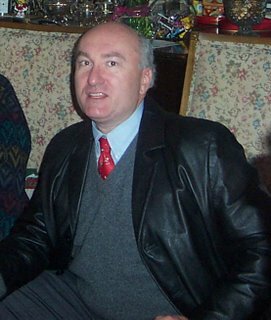 My parents were unable to have children and with Father Lodes’s help, through Catholic Charities, they adopted both my brother and me in 1953. I was an infant and the adoption was arranged before my birth, and my brother was a two (2) year old from the Magdalene orphanages in Ireland. Out of gratitude, my parents became close to and financial benefactors of Father Lodes. 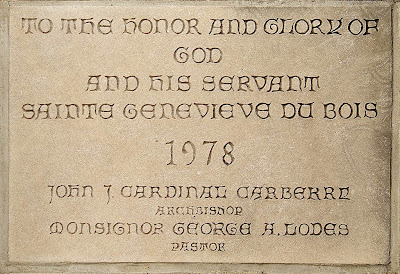 When Father Lodes had the idea and permission from the Archdiocese to start the Ste. Genevieve du Bois Parrish, my parents were ardent supporters and pledged to be members as well. At the time we lived in Town and Country. Father Lodes was able to secure and purchase the property for what is now the Church and school. My father purchased an existing home on 518 Beaucaire Dr. in Warson Woods. 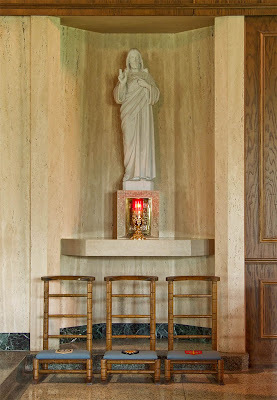 He had his carpenters remodel the living level for Father Lodes as a residence. 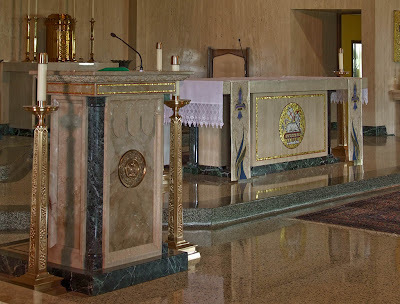 He had his crews finish the lower level of the home as the Church, which was then sanctified by the Archdiocese and the Parrish was formed. We attended many masses in the basement of the home, as well as many visits with Father Lodes in his residence on the first floor. 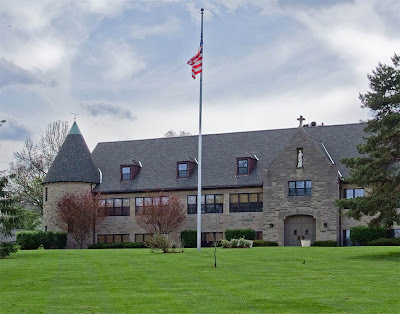 When Father Lodes moved the Church to the present grounds and occupied the Rectory, the Archdiocese de-sanctified the residence at 518 Beaucaire Dr. My brother and I were approaching school age and my parents wanted to live in the Parrish so we could attend the school. (In those days you were not allowed to “chose” your school or Parrish, but were directed by boundaries determined by the Archdiocese.) So while my father worked on obtaining ground upon which to build a new house in the Parrish, we moved into the home at 518 Beaucaire Dr. Subsequently, my father secured ground and built a home in Ladue, where the back property line was actually the border between Ladue and Warson Woods, much like the North edge of the Parrish property. We lived very close to the Church and School, and my brother and I were in the first classes of the School, with me in first grade and my brother in second grade. Thanks for your comments and history! I graduated from Ste Gen in 1966. Years later while in St Louis on a business trip I stopped by to visit the now completed new church. Monsignor Lodes, retired, suffering from his stroke was outside enjoying the afternoon. I identified myself. He remembered me. I had been an altar boy and my mother the school nurse. He gave me a personal tour of the church, I congratulated him on getting it built, recalling the oil painting of the original plan that hung outside the cafeteria years ago. A memorable day!